From the Jaswant Thada memorial in Jodhpur, also known as the Taj Mahal of Marwar, one can enjoy a breathtaking view over the Umaid Bhavan Palace. Being strapped for time, I wasn’t sure I ‘d manage to make my way there, but there was something so majestic in the palace’s distant silhouette that I decided to rethink my itinerary in order to squeeze the Umaid Bhawan in. So, after having the time of my life in the Mandore Garden, studded with the most intricate chhatris, I headed for the intriguing palace. Needless to say, I kept my expectations high. After visiting quite a number of palaces in India, I can sure say that the Umaid Bhawan gives a different feel compared to the majority of royal mansions. It’s definitely imposing, but not ostentatious. It doesn’t rub its grandeur in one’s face. With its solemn terracotta walls and monumental towers gathered around the huge central dome, this palace is extremely dignified, elegant and composed. 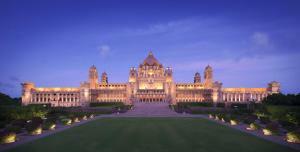 If I had to describe the Umaid Bhawan in one word, this word would be ‘classy’. Everything is classy about this place – from the manicured, spick and span lawns, to the beautiful interiors and perfectly designed courtyards. The architectural style of the edifice also makes the Umaid Bhawan stand out amongst the palaces throughout India – apart from the common amalgamation of the Indo-Saracenic and Classical Revival styles, the structure also features a great deal of Art Deco designs and patterns. The first one functions as a museum, comprising a large collection of photographs, glasswork, porcelain ware, and clocks. There is also a lot of information about the construction of the palace, and what I liked the most is that they acknowledged the achievements of the architect, Sir Samuel Swinton Jacob, and engineer, Henry Vaughan Lanchester. It wasn’t like “Maharaja so and so built this palace in the year so and so”. The third part is the residence of Gaj Singh, the current Maharaja of Jodhpur. The complex is spread across the area of twenty acres, and with 347 spacious rooms in the palace, the Umaid Bhawan is considered one of the largest private residences in the world. The foundation stone was laid in 1929, during the king’s reign. The idea behind the construction of the palace was to provide employment to around three thousands of local farmers who struggled with a severe drought. The earnings helped them combat the famine conditions. It took around 14 years to finish the construction. Inside the Umaid Bhawan Museum. This painting in the exhibition hall depicts a Rajput War. In the background, one can see the Mehragharh Fort. I reached there by an autorickshaw, it was fast and convenient. Make sure to haggle a bit, as rickshaw drivers in the touristy parts of Jodhpur are real sharks, from my personal experience 🙂 Bear in mind that the Umaid Bhawan Palace is located 7 km away from the city. ~ The entry fee is Rs 30 for Indians and Rs 100 for foreigners. ~ The place is open from 9.00 am to 5.00 pm on all days of the week. ~ Best time to visit is from October to March. I visited in May, though. If you’re as crazy as me, please take a hat to protect your head, or perhaps even an umbrellar. Also, sunblocks and plenty of drinking water are a must. ~ It will take one to two hours to explore the place. ~ There are certified English and Hindi speaking guides offering there services in the museum. Liked the post? Save it for later! This entry was posted in Destinations in India, Rajasthan, Uncategorized and tagged architecture, Jodhpur, palace, Rajasthan by indiapalette. Bookmark the permalink. its so freaking big! you cant help but notice it. Very worth visiting! Oh yes, the sheer size of the Umaid Bhawan is so impressive. And yes, Im so glad I got to see it! It is indeed! A real architectural gem! I must compliment you on the lovely post and also choice of the template that goes so well with the palace theme . Thanks a lot, Preeti, and welcome to my blog. It is a beautiful place, I was lucky to stay there for two nights when it won the Tripadvisor award! I will never forget the experience! Oh, do you have an article on your blog about this experience? I’d like to read it! I agree it looks and sounds so classy. Love the architectural stonework and those lawns too. It all makes me want to know more about the original owners and residents. Yes, obviously they were people of good taste. Thanks for stopping by, Elaine.